Step aside argan oil, keratin is the new must have hair care ingredient for luscious locks. For those of us who can't afford the luxury of a salon keratin treatment, not to worry as the hair protein is quickly making it's way into many new ranges of hair care. For those who don't know, keratin is a protein naturally found in the hair and is used as a sort of restorative treatment to smooth and strengthen the hair which is a must have if you experience any frizz. With this new trend, I've picked up 3 different kinds of keratin based hair care to put them to the test and see which one came out on top. 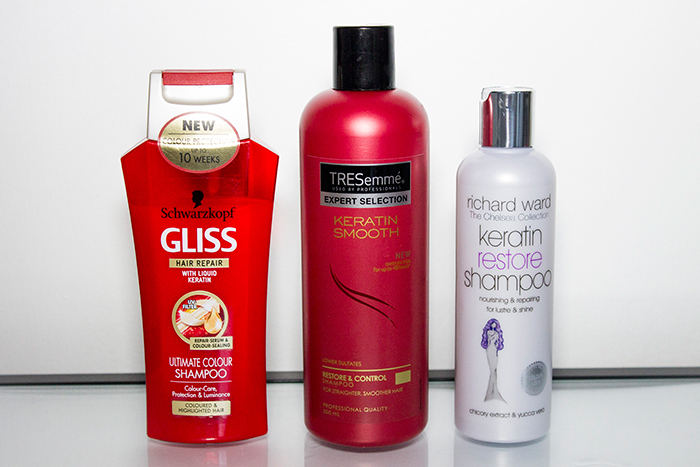 The budget buy of the bunch is the Schwarzkopf Gliss Hair Repair Ultimate Colour Shampoo with liquid keratin. It has a really nice, pleasant fruity scent and although it comes out of the bottle with a conditioner looking formula, it's definitely not heavy. It's actually extremely foamy and not too hard to wash out of your hair but I did wonder if I was getting any nourishment from the keratin. It certainly didn't dry out my hair any more than regular shampoos but I felt that it didn't wow me in the way that keratin products should. Not too bad for an everyday shampoo at around £1 but for something extra special, I'd give it a miss. The first keratin based product I tried was the TRESemmé Keratin Smooth Infusing Shampoo which is probably the most well known of the three. In comparison to other TRESemme products, it has the exact same scent and texture as their other shampoos so if you're a fan of those, you'll probably like this. One downside in my opinion is that it's quite difficult to tell if all the product has washed out of your hair. When I look for shampoos a quality that I like is when it's easy to tell when the hair is clean so I have found myself spending a lot more time washing it out than I usually would. It definitely has a smoothing quality to it once dry but sadly I find it a little too difficult to work with. It also claims to be suitable for use after keratin treatments but from my understanding, it still contains sulphates which you're supposed to avoid so I'm not so sure that claim is true. I think I might have more luck with the treatments in the Keratin Smooth range but I don't find this one all that special. Next up is the Richard Ward Keratin Restore Shampoo* which you can pick up via Waitrose. I'd never had experience with this brand before but it's safe to say, I'm thoroughly impressed. This might be my new favourite haircare line. Surprisingly it has the same scent as the TRESemme one but I find this much more nourishing and easy to rinse. As I have quite oily hair, I can never pull off second day hair but with prolonged use of this stuff, my hair looked so fresh and clean the next day which is definitely a winner for me. I think you have to use it a few times to really see the full results but I'll definitely be picking up more when I run out, I don't think I can go without it now! All in all, I think with any new trend there's going to be a few hits and misses, just think how many brands joined on the argan oil/bb cream trend! I'd definitely say the Richard Ward range was my favourite and if you're looking for a good nourishing hair care range, look no further.